Anyone who is, or ever has been owned by a cat, knows that cats work on their own agenda and despite their aloof nature we love them anyway. I first became aware of The Cat’s Eye Tarot several years ago, when Debra Givin first began her creation of this deck and followed it’s progress with each card. When US Games announced that they were going to be publishing it, I nearly fell out of my chair with excitement! There are several cat themed decks out there but this one is truly special, not only does it follow the Rider-Waite style, each card tells a story from a very unique perspective…A cats! What better way to see the world than through the eyes of a beloved cat. 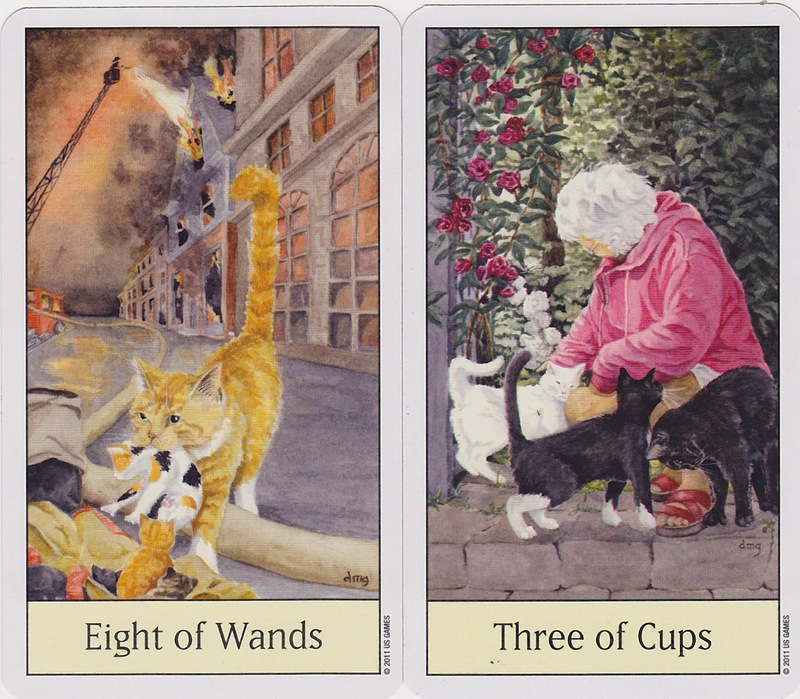 Debra, a practicing vet for 22 years, exclusively in feline practice, she has absolutely captured the essence of cats in this deck and with each card there is no doubt as to what is going through these glorious kitties minds. This deck is simply perfect in size and works great for those with smaller hands as it’s not too wide to shuffle and handle properly and it has an amazing glossy lamination. I’m big on the art of the card backs and have been known to choose decks in part by the wonderful imagery on the backs and this deck does not disappoint. 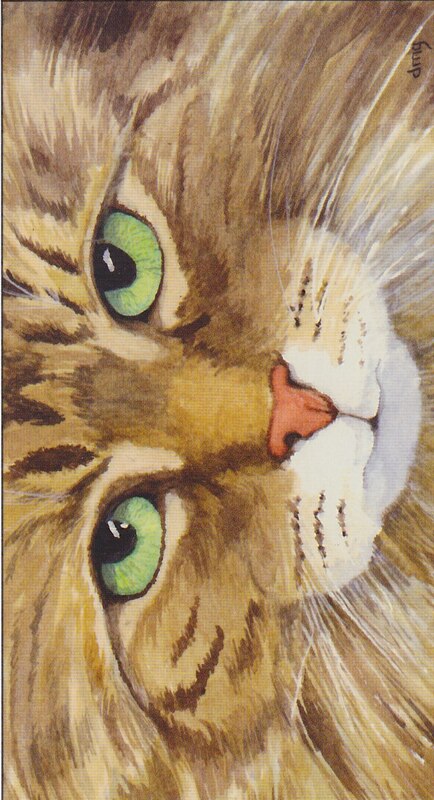 It features a brown long haired tabby with mesmerizing green eyes that nearly fills the whole card save one thin border of white. The Major Arcana are graced with cats of white, calico, ginger and tabby, black and siamese all lovingly painted in scenes of blue and plum tones that make these little kitties pop right out of the cards. I always look for a select few cards when considering a deck and the Star is among one of them. I love the way that Debra has portrayed a little calico gently reaching out to the reflection of a star in chilly stream and it brings to mind the phrase “reach for the stars” what a great way to get the meaning of hope across! 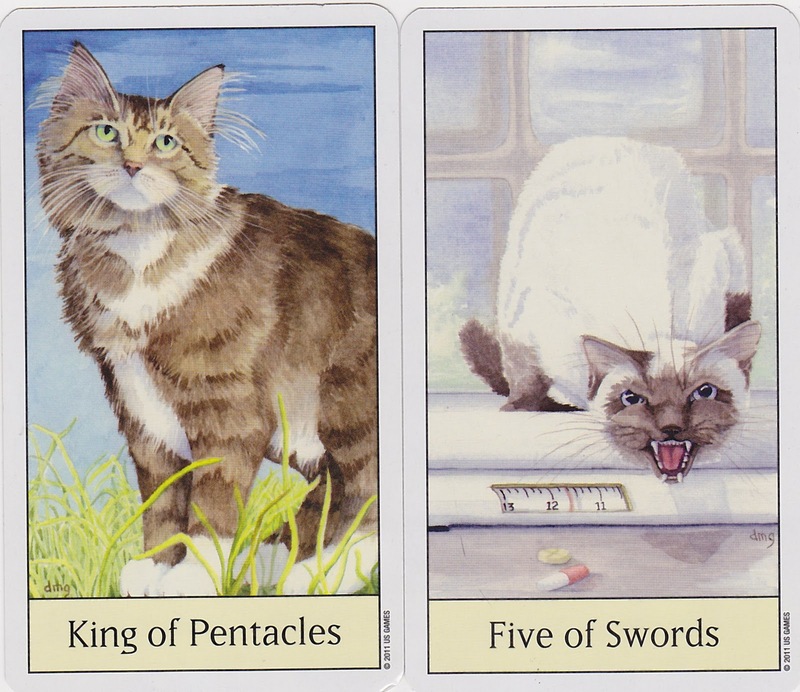 The Minor Arcana are just as charming with the suit of Wands picturing fiery ginger cats, the suit of Cups showing wonderful jellicle kitties, the suit of Swords featuring the talkative siamese and the suit of Pentacles with it’s tabby striped beauties. 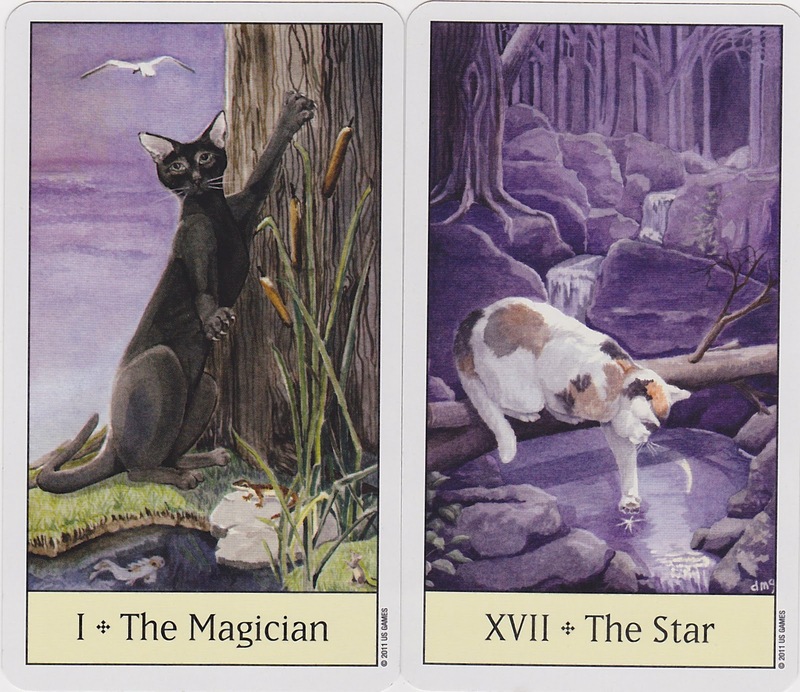 Also featured alongside these fabulous felines in the Minor Arcana are fish, reptiles, birds and mice. I had the best time while working with this deck, I found that it reads very well and I had no problems getting clear and concise messages, just like ones I receive from any cat when he/she is letting me know how it is! 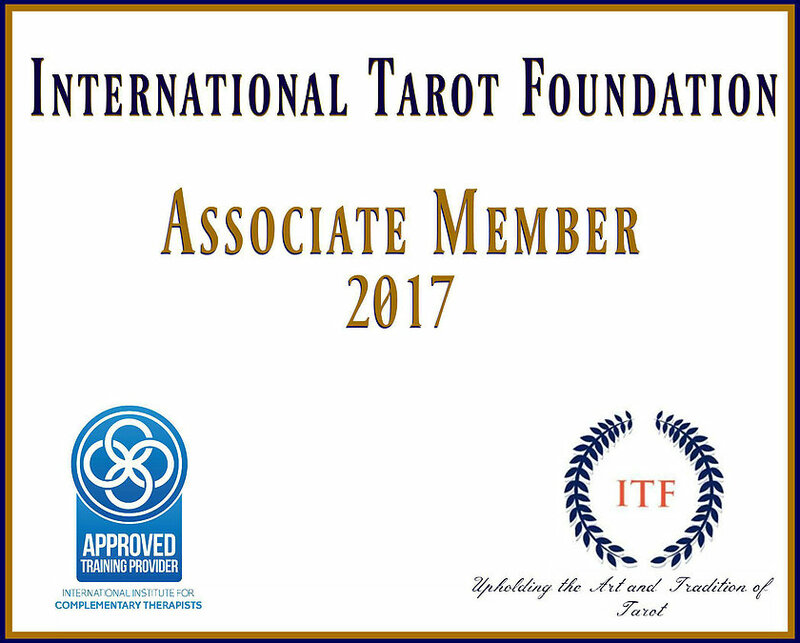 I may not recommend it as a beginners deck, however, I think that a basic knowledge of the Rider-Waite symbolism would be helpful but this is truly a deck for anyone who loves and shares their life with cats. Excellent review, I for one not the greatest cat lover (domestic) unless it’s a Moutain Lion or other large Cat. I must admit I was impressed with the deck and the card paintings/artistes captivity of the cat. Been meaning to get these for a while having purchased the Tarot of the Cat People and the Bohemian Baroque Cats Tarot (Yes….I love cats!). Excelent article! I´m a cat-lover!